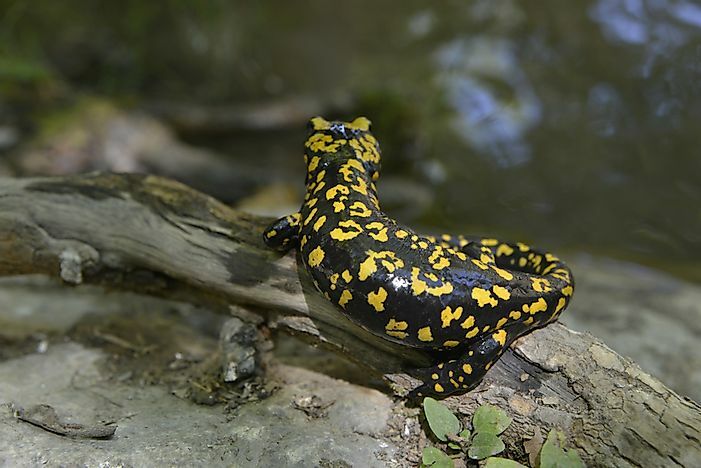 Iran's amphibians are generally found concentrated in the riverine wetlands it shares with neighboring Pakistan, Afghanistan, Turkey, and Iraq. A Near Eastern Fire Salamander. Iran’s amphibians are mainly concentrated in the riverine wetlands it shares with neighboring Pakistan, Afghanistan, Turkey, and Iraq. The amphibians of Iran mostly inhabit the provinces in the northwest due to the abundance of water. In a country with different ecological regions, the most widely spread amphibian species are those that exhibit excellent biological tolerances. The Indian Marbled Toad (Bufo stomaticus) is native to Iran as well as other Asian countries, including Pakistan and Afghanistan. The toad is characterized by the absence of the cranial crest. The animal’s underside is whitish, and there is dark mottling on its throat. The tympanum of the ear is notably two-thirds the eye’s diameter and the space between the eyes are wider that the upper eyelid. The second finger is nearly equal to the first, and a spiny ridge is present on the tarsus. The toad is listed as least concern since it is under no significant threat and due to its broad habitat range. The Skittering Frog (Euphlyctis cyanophlyctis) roams widely across several South Asian countries including Iran. The frog is olive or black colored above, has a light gray dorsum, a white ventrum, and one or two white or yellow irregular streaks on the thighs. The frog’s tympanum is nearly two-thirds the size of the eye and its toes are entirely webbed. The fingers are slender while the first does not exceed the second. The frog has a wide habitat range and mostly inhabits wetlands such as pools and marshes. Its name is derived from its behavior of skittering over the surface of the water when its habitat is intruded. The males initiate calling during the breeding season, and a female may pair with numerous males to lay many eggs. The frog mainly feeds at night on tadpoles, grasshoppers, beetles, and aquatic insects. No significant decline in population has been identified, and the frog is listed as being of least concern. The Iranian Earless Toad (Bufo Surdus) is part of the Bufonidae Family. The species mainly inhabits intermittent freshwater marshes, irrigated land, tropical and subtropical dry shrublands, grasslands, and freshwater springs. The toad is listed as least concern since there has been no notable decline in its numbers. Degradation of their various habitats is the chief threat to the sustainability of the toad. The Marsh Frog (Pelophylax ridibundus) is a common species across large parts of Asia and Europe. The species is aquatic and has webbed feet to aid in swimming. Marsh frogs have a distinctive light green color with dark spots. The female can reach a maximum length of 17 centimeters while the males are smaller. The species feeds on small invertebrates such as spiders and insects. The frog mainly mates during the spring, when the female lays around 1,000 eggs in water. The tadpoles stay in the water until they mature into frogs and can the leave the water. Although listed as least concern, water pollution, and habitat loss are threats to the species. The Near Eastern Fire Salamander (Salamandra infraimmaculata) is native to Iran as well as Iraq, Israel, Lebanon, and Syria. The species is characteristically black with yellow spots only on its back and none on the underbelly. The salamander also has four large yellow blotches on its head. The species inhabits forests, especially cork forests in Iran, as well as temporary water pools. The salamander hides during the day and emerges at night. It feeds on smaller invertebrates such as earthworms, snails, slugs, and other insects. The species is ovoviviparous and breeds during winter. The salamander is listed as near threatened due to habitat loss. The amphibians of Iran collectively face a number of natural and human threats alike. Drought conditions affect the sustainability of the mostly aquatic species. Urban activities and habitat loss have also had impacts on the ecological balance critical for the survival of the amphibians.